Who Provides the Best Deck Installation in Pompano Beach, FL? You Are Here: Home / Azek Decking / Benefits of PVC Decking / Brock Dock / Deck Installation / Dock Supplies / HDPE Decking / Pompano Beach / PVC Decking / PVC Decking Prices / What is the best material for my deck? / Who Provides the Best Deck Installation in Pompano Beach, FL? When you’re looking for a new deck in Pompano Beach, having a reliable deck installation company is important. You don’t want to hire just anyone to install your new deck, you want the best. 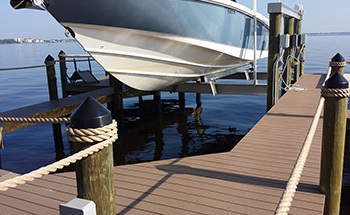 At Keys Deck & Dock Supply, we offer the best deck installation in Pompano Beach. We have many different types of deck surfaces and supplies for all of your decking needs. At Keys Deck & Dock Supply we offer many different types of decking materials. Our most popular material is PVC decking. PVC decking has so many great benefits, and requires little to no maintenance. The UV resistant colors do not fade from the sunlight, ensuring your deck will look great for many years. PVC decking is also slip resistant making it extremely safe for your children. These are just a few of the many great advantages to getting new PVC decking in the Pompano Beach area. There are many different color options available with our different decking materials, and you’ll be sure to find the right option for your home. If you’re unsure if installing a new deck is a good option for you, contact our experts at Keys Deck & Dock Supply. Summer is right around the corner, and if you’re sick and tired of your old and outdated deck call Keys Deck & Dock Supply today. We’ll help you choose the perfect material for your new deck. What better way to kick off summer than with a new deck for your home? If you’re ready to upgrade the look of your backyard, call Keys Deck & Dock Supply today.